How do you market that which is considered the “niche of the niche”? Time to find out! Hakuoki is a franchise that you’ve probably at least heard of due to its popularity and the influence it’s had on the otome genre in the West. For Western fans, one very notable thing is that prior to Hakuoki: Kyoto Winds, the franchise was localized by Aksys Games in the US and Rising Star Games in the EU. This meant that Idea Factory international had its work cut out for them when they decided to take over localizing the franchise. Localizing any game is a challenge, but having a popular franchise change from one publisher to another can add entirely new problems to that equation. You have to not only let that fanbase know you’re the new home of that franchise but also soothe their fears that this new guardian will take care of their beloved games and characters. Plus, if they were major fans of the previous publisher, they may feel that you’ve come in and taken something from them. All of this means you need a solid plan going forward, not just with the localization itself, but also with the marketing. Thankfully, Idea Factory International had just the person I could e-mail, Ari Advincula. Ari is Idea Factory International’s PR & Marketing Coordinator, as well as being quite familiar with the Hakuoki franchise herself. If that name sounds familiar, it’s because she also answered some of our questions about Mary Skelter: Nightmares in a separate interview which can be found here. Regarding Hakuoki: Kyoto Winds, however, there were more than a few questions I had regarding the marketing push IFI was giving the title. These include the “Official Hakuoki: Kyoto Winds Festival + Cafe,” the Hakuoki: Kyoto Winds Limited Edition, and just how IFI, Idea Factory and Otomate all fit together. Please take a look and be sure to come back tomorrow where we’ll have one more interview with the localization team and talk about their own challenges, successes, and history with Hakuoki. Operation Rainfall: Many casual otome fans are probably at least familiar with the name “Otomate” which is the label that Idea Factory develops its otome games under. However, many Otomate games have been published or announced for localization in the West by other publishers. With that in mind, what are the differences between Otomate, Idea Factory, [and] Idea Factory International? Arianne Advincula [PR/Marketing Coordinator]: Otomate is a brand of Idea Factory that publishes otome titles, while Idea Factory/Compile Heart develops and publishes JRPGs and popular series like Neptunia. Idea Factory International localizes and publishes games for the West. We are separate from Idea Factory Japan but we work closely with Idea Factory and Otomate (and their developer, Design Factory) to localize their otome games and JRPGs for the Western market. OR: As a follow-up to the previous question, what exactly is involved with getting approval to localize a game from Idea Factory in Japan, and would IFI like to publish more Otomate titles in the future? AA: Of course I would love to bring over more titles! There’s multiple factors that determine a title’s localization, such as community feedback and release timing, but ultimately, we’re open to localizing a variety of titles if there’s enough demand. OR: On April 30, 2017, IFI held the “Official Hakuoki: Kyoto Winds Festival + Café” event. What was the general response to this event, and what kind of things did you as a company learn from interacting so directly with the fans? 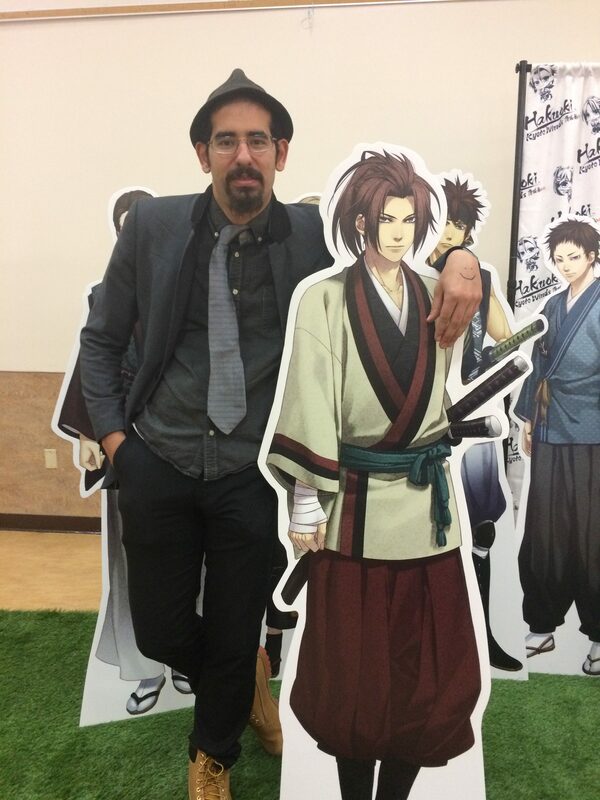 AA: This year’s Official Hakuoki: Kyoto Winds Festival + Cafe was amazing! 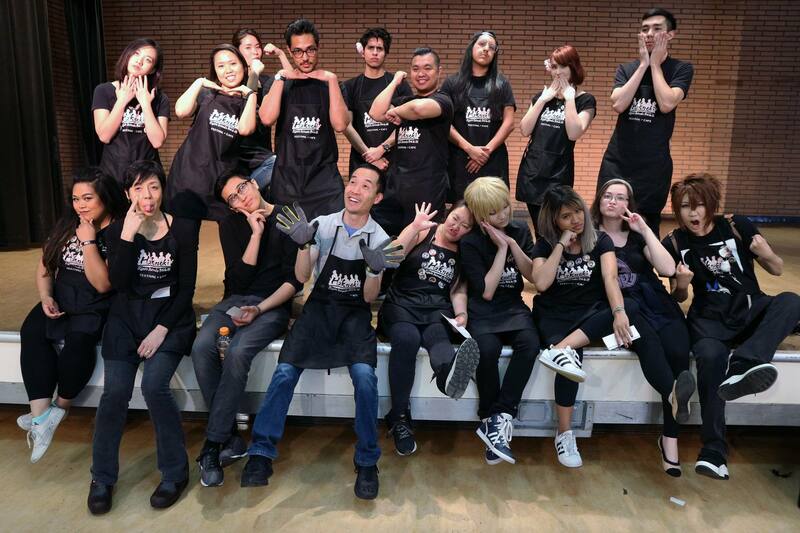 Dedicated otome fans from all over the US, as far as New York and Florida, traveled to California for this one-day event. It’s very special to us because, as a small team, everyone had a hand in realizing the “very first company-sponsored otome cafe in the West” and it’s an event that never would have happened without the otome fan’s support. Speaking with the fans made us truly realize how dedicated and widespread the Hakuoki fandom is in the West and it was really rewarding to celebrate the culture that has developed around the title. 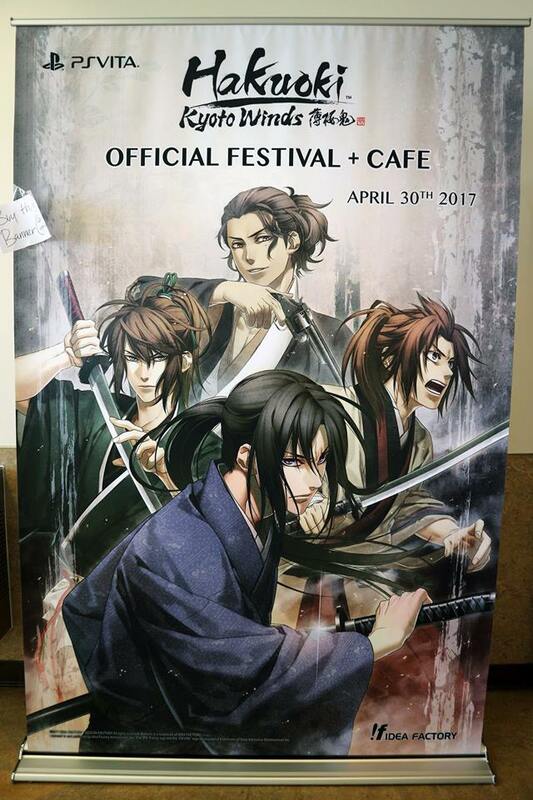 The Official Hakuoki Festival + Cafe was not only a unique event, but it was also quite the undertaking by IFI. 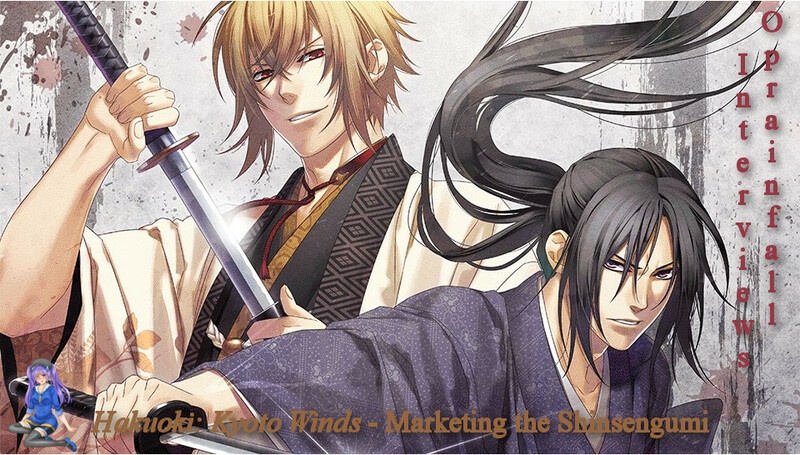 OR: Something that’s quite interesting is the strong marketing push that IFI has given Hakuoki: Kyoto Winds. Between the “Festival + Cafe” event, goods available on Iffy’s Online Store, creating life-size character stands for events, and its Limited Edition, it feels like IFI is giving Kyoto Winds the same marketing it would normally reserve for a Neptunia game. What made you decide to treat Kyoto Winds like a flagship title, and how difficult was it to get all these pieces in place? AA: Just like Neptunia, we recognize and understand how beloved Hakuoki is. We want to pay respects to that. Hakuoki has been released in the West previously, and in Japan it has stage plays, musicals, movies, and an anime–there’s a very passionate following for it! We wanted to show otome/Hakuoki fans that we do understand and care about otome culture by bringing an Otome Cafe to the States. OR: Speaking of the Hakuoki: Kyoto Winds Limited Edition, the quality of this particular LE is a cut above what IFI normally does for them. From the “Shinsengumi Warriors Bento Box,” to the furoshiki, to even the sturdy matte-finish box, it’s obvious a lot of love was poured into it. What made IFI decide to go all out with this LE and will we see the same bump in quality with future LEs? AA: We try to go “all out” for all of our limited editions, not just for Hakuoki: Kyoto Winds! It was a lot of fun creating these items because Hakuoki is completely different from titles we’ve done before–there’s so much you can do with such beautiful art and a gorgeous setting like Kyoto. You can definitely expect the same special IFI treatment in all of our LEs. OR: Finally, while the otome genre has its fans, there are those who would argue that IFI’s resources would be better spent on other titles. With that in mind, why did IFI put all this effort in promoting Hakuoki: Kyoto Winds the way it has, and how would the success of Kyoto Winds benefit even those fans of IFI who have no interest in otome games? AA: As I mentioned before, Hakuoki is series loved by many dedicated fans so we approached the title with that audience in mind. Even if you’re not interested in the Hakuoki series, any Idea Factory International title doing well means that we can continue to publish niche titles overseas, which means more Japanese titles for overseas fans to enjoy. Everyone wins! The IFI staff showing they know how to have a good time at the Hakuoki: Kyoto Winds Festival + Cafe Event. So, what do you think? Do Ari’s answers satisfy your curiosity and did IFI’s marketing push for Hakuoki either win you over or convince you to give the franchise a try? For myself, I’ve found IFI’s marketing efforts quite interesting to follow. As I noted in my questions they really promoted this like they would a Neptunia title, which is no easy effort. Add to that the “Festival + Café” event and LE they put out and I think this is a good case study of how to properly promote a game. Especially when you consider otome titles tend to be considered the “niche of the niche” when it comes to Visual Novels. That said, I do hope that IFI continues to apply the things it learned with Hakuoki to its other projects. Hey, who says I’m not allowed pick a husbando as well? Souma’s a gentleman. Thanks again and see you all tomorrow!